Elaine Urton died on June 16, 2015 after a brief illness. She was the beloved wife of Kenneth Urton, a prominent builder, whose projects included the Earl Warren Show Grounds, the Santa Barbara Airport, Television Station KEYT, and many others. Kenneth was the partner of his father, Charles Urton, who had built the Granada Theatre, the News-Press building and other major structures. Elaine was born May 1, 1914 in San Francisco, the elder daughter of Whitford Kelly and Edna Stone. She attended the California College of the Arts in Oakland and then worked as a window designer for Gatner and Mattern. In March 1934 she met Kenneth. They were married on June 30, 1935. While they were expecting their first child, Sherrill, they moved to Santa Barbara, where Charles Urton made Kenneth his partner in Urton Builders. Sherrill arrived in 1936, and two years later her sister, Marcia, was born. While Kenneth was pursuing his very successful career as a builder, Elaine was actively involved in community affairs, mainly in promoting the arts. She was a volunteer with the Santa Barbara Art Museum since its inception in 1941 and chaired the Building and Grounds Committee for many years, as well as the membership committee. Later, she chaired the Women’s Board and became an Honorary Sustaining Trustee of the Museum. She also chaired the Women’s Board of the Music Academy of the West and was a volunteer with the Assistance League. She was indeed a lifelong patron of the arts and was also a very accomplished artist in her own right. Her oil paintings and watercolors exhibit a prodigious talent. In addition, she was a fine pianist who performed duets with other players. Elaine’s many activities did not interfere with the loving relationship she enjoyed with her husband. Devoted to each other, they experienced much together, including travel to exotic places: the Silk Road, the Galapagos Islands, Korea, Russia, Sweden, Ecuador, Kenya, Morocco, among many others. Antarctica was the only continent they didn’t visit. 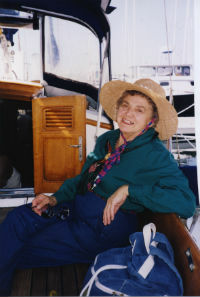 She shared her husband’s passion for sailing and crewed for him when he competed in races in flatties and Geary sailboats. Then they acquired the 46-ft. Selene, which they sailed frequently to the Channel Islands. In 1957 Kenneth became Commodore of the Santa Barbara Yacht Club. Elaine became a widow in 2003 and is survived by her two daughters, six grandchildren, seven great grandchildren, and five great great grandchildren. She will be remembered as a remarkable person, lovely and spirited, witty and interested in everything from politics to Nietzschean philosophy. Her memory will be treasured by those of us who knew her.